I love the commercial on TV where a lady is at her back door and she is calling for her cat that she had let out. Using the normal calls for domesticated cats she tries fervently to retrieve her pet. Unbeknownst to her, due to her poor eye sight, she thinks she is letting in her cat when it turns out to actually be a raccoon. This commercial holds true to life exactly what you could be doing with raccoons in your own vegetable garden. Your vegetable garden is an inviting source since it gives them easy access to the food they need. Issues with raccoons most often occur in areas close to the woods, a forest and sometimes in the city if you live near an alleyway with lots of dumpsters. In order to get the best solutions for raccoons I once turned to the experts on our vegetable gardening Facebook fan page. Here is what they came up with. Traps are a good way to remove not only raccoons from your home vegetable garden, but other rodents as well. They are fairly inexpensive and can be used over and over. Many of the respondents to the post suggested using dog food as bait as that seemed to work well for them. Once trapped drive the animal at least 10 miles from your home to a wooded area and release it. Just be careful when you do. Raccoons are very protective of their young, in the event you trap their babies as well. If trapping the animals yourself is not appealing many areas have animal control that is available to them. A phone call or two to your local animal control and they can take care of the problem for you. They might even have the cages to rent so the raccoons can be trapped and they will get rid of them for you. This one is also popular for squirrel control as well and that is to either use hot pepper powder/flakes and surround the perimeter of your garden with it or crush hot peppers and mix them with water, blend thoroughly and put in a spray bottle to create a pepper spray that you can also spray the perimeter of your garden with. You will have to reapply after every rainfall. The hot pepper works as a good repellent. This was my favorite option of all and that was to put a water sprinkler on that would spray water once a connected motion detector sensed something was moving in the garden. It is safe to both the gardener and the animals of course and all respondents that used this method claimed the raccoon problems were gone within a week. Just remember to shut it off when you are heading to the garden or you may become a victim of your own trap. 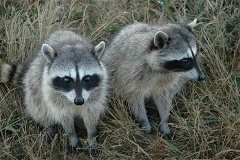 If you have an issue with raccoons or other animals that are causing problems in your home vegetable garden then put one or all four of these methods to work for you. You could be raccoon free in no time. Mike is the administrator for the largest vegetable gardening group on Facebook. You can join the vegetable gardening group for free. Having clay in your soil is a very common problem. You may not know where it came from, but rest assure you know it is in your vegetable garden. Clay, like many other elements in nature, naturally occurs usually through a gradual weathering of rocks or some other silicate based item. The biggest disadvantage to having clay soil is poor drainage and when water sits in the soil the roots of your plant will rot. You may have an issue with clay in your soil but so do many other people and that is why we posted on our vegetable gardening Facebook fan page this very question. ‘How do I solve the issue with clay in my soil?’ As usual we received a tremendous amount of responses to the question from our thousands of experts. Here are the two answers that came in on top as the most popular. I write a whole book on the benefits of raised bed gardening. In fact, many expert vegetable gardeners have. Raised bed gardening is the practice by which you raise up the soil beds to plant your seeds and vegetable plants. This can be done by using pots, or building box planters and so on. Raised bed gardening allows you to control the soil that is in the raised bed as well as creates the means by which you will have plenty of water drainage. Although Alex suggested that you drink plenty of whisky and hope that the problem goes away, he and many other expert vegetable gardeners like Alex, suggested mixing in large amounts of organic matter such as leaves, grass clippings, your left over dinner, and cow or chicken manure to name a few. Large amounts of buried organic matter will attract an underlying ecosystem that will break this matter down into useable valuable compost. Over time with a strict regiment of heavy organic feeding to your soil, the clay will be replaced with wonderful fluffy rich dark soil. Both items listed above will solve your clay soil problem and if you were to combine the two you should never have any more problems with it. Your beds will have adequate drainage due to the raised beds and your plants will have all the nutrients they need due to the organic matter. Mike the Gardener Enterprises, LLC is the exclusive home of the seeds of the month club where you can get 4 packs of vegetable, fruit and herb seeds every month. Last vegetable gardening season marked one of the wettest we have had on record here in the northeast part of the United States. It seemed to rain nearly every day and when the rain fell it was not a light drizzle but constant down pours. Your vegetable, fruit and herb plants require water just like everything else in life, but too much water can do more harm then good. Regardless of the amount of rain you receive there are remedies that you can implement that will help whisk away the excess water. I recently posted this question on our vegetable gardening Facebook fan page to see what the expert gardeners had to say and what they recommend helps them through periods of too much water. It is a light hearted fan page so we do receive some funny solutions from our expert vegetable gardeners, which included Orvil`s suggestion of using sponges, to Mickie`s naked rain dance and of course Franny saying to “just tell the rain to go away.” All great suggestions of course, but none really too practical. They did have more real world solutions though and here they are. Available for just a few bucks from your home or garden center, water crystals make for a great way to help absorb the excess water. A very practical solution for those with smaller gardens, but if you have a larger garden then this option could get pricey so keep that in mind. Many suggested using a good mix of sand and compost together too help absorb the excess water while at the same time using the water run off itself to push the nutrients of the compost into the soil. This was the most popular answer and I have combined all three of them here because the premise works the same for all three. 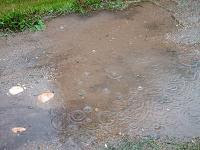 The idea is to create a drain where the excess water will run off away from the plants and into the moat or trench. Raising the beds of your garden will create a natural trench between the rows. One person suggested a very creative idea and that was to whisk that run off through a French drain into some rain barrels so that the excess water can be used at a later date when you may experience dry spells. These are just three of the many solutions that are available out there to make sure your vegetable plants do not receive too much water. Remember, too much water for a plant could result in root rot which will kill your vegetable plant. So make sure you monitor how much moisture your soil contains. You can either pick up a soil meter from your local home or garden center for a few bucks or go the el cheapo route like me and pick up a handful of dirt from your garden and squeeze it. If water drips out after you squeeze it, your soil has too much. If that is the case, try one of the solutions above and test regularly until you have your water issues under control. What a better way to see the fruits of your labor then to grow a vegetable garden, right? You spend countless hours making sure you do everything right so that the fruit and vegetables you harvest are the best tasting you have ever grown. However, looking through your kitchen window one morning you notice your neighbor’s cat decides to use your home vegetable garden as their personal litter box to do their business. Don’t get mad at the cat, (maybe your neighbor though). The cat is just working off of their instincts as to how they were taught so they see a spot that looks like where they should go and, well, they go. Just like the cat’s owner trained it to do it’s business in an appropriate spot, you must train the cat that the appropriate spot is not your vegetable garden. 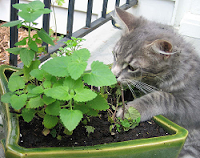 We asked our experts on our Facebook vegetable gardening page as to what methods they use to deter cats from doing their business in their vegetable gardens, and here is what they came up with. Are you a dog person? This seemed to be the biggest consensus for many who responded, and that was to get yourself a dog to let the cat know not to enter the yard. Of course with owning a dog comes a great responsibility in many cities and towns all over the world, from licensing to shots, to leash laws and the list goes on and on. So keep this in mind if this is the route you choose. A number of people suggested using cocoa mulch to act as a natural deterrent for cats and although I have read no scientific studies that suggest this, those that did post this claimed it worked great and one person wrote that it even helped with her snail problem. The next method of choice for deterring cats was to sprinkle hot pepper flakes in and around the area where you see the cat attempt to do its thing. However, those that wrote in that used this method said that after a rain, you need to replenish the source. In other words put down more hot pepper flakes. There are also a number of devices that came up in the conversation. The one mentioned the most was netting over the garden. This allows for the plants to receive the sunlight, water and nutrients they need and at the same time keeps the cats out. Another popular device, although it was not named, was an electronic device that emits a sound that is unheard of to humans but apparently not liked very well by the cats in the neighborhood. You will have to do a Google search on such devices to find out what works best for you. Finally, last but not least, but last for a reason, was to contact your local SPCA or animal control department to rent some cages and trap the cat. Just like dogs, cats have rules they must abide by as well so your neighbor just can’t let their cat roam around all over the place. I left this for last, because this should be a last resort after all of the above have failed. You don’t want to create a war with your neighbor over something that could be handled differently. However, if you tried everything else, then go this route. The local animal control board will warn your neighbor about the issue. Cats make great pets; there is no question about it. But you do not want them to interfere with your home vegetable garden and you certainly do not want them to do their business there. Try the methods above to make sure you can deter them from causing you any problems. Tomatoes rank first as the most popular item to grow in a home vegetable garden. Although botanically they are classified as a fruit, most people refer to them as vegetables. Regardless of what you call them, there are literally thousands of varieties to choose from. You can get them in the small variety such as cherry, grape or roma up through the big boys like beefsteak and each of those choices come in a widening array of colors. Whew! That’s a lot to think about right? Not really. The number one recommendation of what to grow from many, if not all, of the vegetable gardeners I speak with at my vegetable gardening Facebook fan page is a simple straight forward one. Grow what you will eat. Don’t waste your time growing tomatoes that will just end up in the compost pile. The idea of growing your own food is to save money and grow food you like to eat. With all of that said, most tomato varieties have weak stems. In other words the tomatoes produced are too heavy for the support system that the plant itself provides and will, therefore, lead the plant to fall over. The last thing you want as a home vegetable gardener is to have your tomatoes lying in the mud after a big rain. Here are some ideas that some of our Facebook members have come up with to give those tomatoes the support you need. This is the basic method by which most people use including yours truly. With the protected cages available today that can withstand the weather elements, once purchased they can last you forever (so as long as you put them away in the winter time). I have not tried this one myself but this recommendation came from on of our members who swear by it. They use the PVC by placing it behind the plant and then lightly tying the plant to the PVC. One person suggested growing the tomato plant inside the PVC tube, although I am not 100% how that works. Able to some rebar for free off of craigslist one member said they drive the rebar vertically into the soil and use it as a stake. They use expandable Velcro ties (available at your local home or garden center), to tie the plants to the rebar. One member wrote in that they asked a neighbor for the fence posts of an old wooden fence they were taking down. The fencing was made from cedar and was neither stained nor treated, which is good because you do not want any chemicals near your tomatoes or any other vegetable for that matter. Attach to the fence post with one of the previously mentioned methods. Another very creative idea that came in that I am definitely going to give a try to this season is the use of lattice fencing. A quick image search on Google will show what lattice fencing looks like. In any event, this one particular member actually weaved the tomato plants through the lattice as it grew. Very creative indeed and the plant was very well supported. These are just five of the many, and I really mean many, ways to prop up your tomato plants. 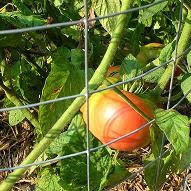 Pick a method that works best for the style of tomato plant you are growing and the area in which it grows. Over time you will find what works best for your home vegetable garden. Mike the Gardener Enterprises, LLC is the exclusive home of the seeds of the month club where you can sign up and receive 4 packs of vegetable, fruit and herb seeds every month. I have been vegetable gardening for over 30 years. I was taught the skill form my dad who learned it from his. You probably are not too different from me, my dad or grandfather as to the reasons why you have a vegetable garden in the first place. My grandfather and grandmother lived through the great depression and therefore their garden started as a means for food necessity and apparently their very survival. My grandfather would do all the physical gardening labor and my grandmother perfected the art of canning the food so as to preserve it for later consumption throughout the year. Those skills were passed down to my dad, and by the time he had perfected his skills the great depression was long behind the country and vegetable gardening became more of a hobby and a means to save money on food. Today, taking those same skills passed along to me by father and grandfather, I grow a vegetable garden because it allows me to save some money on my food bill, but more important to me is the fact I can control what goes into my soil ensuring that the vegetables and fruit that I grow are healthy, taste great and are safe to eat. I recently polled my vegetable gardening Facebook page to get the reasons why other vegetable gardeners grow theirs and what made them a success in their own right. I received a tremendous number of responses, and here is what they had to say. Although there were many like it, a great answer came from Darlene who said “Don't keep waiting hoping to know everything first because you'll never start”. This is so true. How many times have you said to yourself, that you will start a garden or expand your garden or grow something different but were afraid to do it wrong? The consensus of this unscientific poll found that many vegetable gardeners like you just jump right in and go (or grow in this case). To increase success many suggested that you start seedlings indoors on a window sill or any area of the house that receives plenty of light in portable greenhouses or a humidity dome. Both are available from your local home or garden center for just a couple of bucks. A very popular answer from a lot of the responses was the advice to start with those vegetables or fruits that are “easy” to grow. For example, tomatoes, peppers and cucumbers are considered easy to grow and maintain. They require basic maintenance and will produce high yields. While others suggested starting with herbs or spinach or varieties of lettuce for their ease of growth, my favorite answer came from Beth who wrote, “Have you ever wondered why 80 year old women know so much about gardening?” Her answer was just as true to life as the question, “Because they spent decades figuring out what works in their space”. Relating this back and coming full circle to my own experience with my grandfather, he worked his land (what little he had), and knew what he could and could not grow, and what gave him the best yields. He learned this from trial and error over the many decades he maintained a vegetable garden. My grandfather passed on over a decade ago, but rest assure his skills live on in my vegetable garden, as I am sure yours do with your own family. If you love growing great tasting vegetables in your home vegetable garden then by now you should know that in order to maintain that yearly success your soil needs to be rich in nutrients. There are a number of ways you can add these nutrients to your soil, from decayed organic material, to your food scraps to a variety of chemicals. One of the best ways is to add manure. Certain manures are nothing more than organic matter rich in nutrients waiting for them to be released. When you work manure into your soil you provide a food source for your soil’s ecosystem to feed on. In turn that ecosystem releases the nutrients from the manure that your plants need to grow and thrive. Here is how you can add manure to your home vegetable garden. It goes without saying that the first step in this process is to actually obtain the manure. 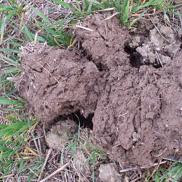 There are a number of varieties of manure to choose from such as chicken, cow, horse and green manures such as alfalfa, winter rye and buckwheat. Never use human, dog or cat manure in your garden. The first place to look for manure is the free website Craigslist. Go to the farm and garden section in your area and search on manure. You’ll be surprised how many farmers, horse breeders and so on will just give it to you for free. If you are unable to find free manure you can always buy it at your local home or garden center. Now that you have your manure you need to understand that the fresher the manure the longer you need to let it sit in your home vegetable garden’s soil before you plant your seeds. A good rule of thumb is to use the manure in the autumn months giving the soil’s underlying ecosystem plenty of time to feed on it so the nutrients can be released. With your manure added to your soil, now is the time that you work it in. You can use a pitchfork, garden tiller, garden ho, you name it. The tool you choose is completely up to you. I use a pitchfork since my garden is a size I can handle within reasonable physical limits. If you have a very large garden, you may want to consider buying or renting a tiller. Now that the manure is worked into the soil, wait until a week or two prior to the following season’s planting dates for this next step. 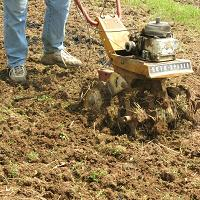 Using your tool of choice, work the soil again so that you are mixing in the broken down manure. This helps spread the nutrients around. Your seeds are now ready to plant. In some cases spreading manure can be a messy (and smelly) job, but the benefits for a home vegetable garden can be tremendous. Follow this every year and you will have great soil for your fruits and vegetables in no time. Your home vegetable garden requires lots of nutrients in order to provide a season’s worth of bountiful fruits and vegetables. The best way to ensure that your soil is filled with those nutrients is to continually add plenty of compost. 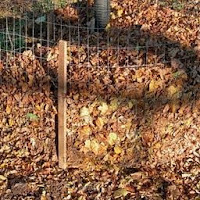 One such great compost source is leaf mold and if you are like me with plenty of leaves around at the end of autumn to work with then you have everything you need to get started. Here is how you can make leaf mold to use in your home vegetable garden. Set up an area in your yard where you can create your leaf mold pile. There are a variety of ways to keep the leaves in place, from open piles, to leaf bins, you name it. The method I like, is to use a piece of fencing and shape it in circle to create a tube looking structure. You can see photos on our website and at our vegetable gardening fan page on Facebook. Once you have your structure in place, take your leaves and add them to it. Put as many of the leaves in there as possible, all of them if you can. I know some people actually use a leaf shredder to reduce their size and then add them to the pile. Smaller sizes help break down the leaves faster, but do not feel that you need to run out right now and go buy a shredder. Allowing Mother Nature to do her thing if you give her plenty of time is all you need to get started. As you add the leaves to the pile wet them down with a hose. Keeping the leaves wet along with the bacteria, fungus and mold breaking down the leaves is what invariably creates the leaf mold which you will notice at the bottom of the pile of leaves once it starts forming. If you have ever walked through a forest in the springtime just as new leaves were forming then you more than likely have seen leaf mold on the ground from the leaves that fell the previous autumn. Add the leaf mold to your garden by mixing it in with your soil. This type of compost is especially good for plants in the cabbage and carrot family. Leaf mold is one of the easiest forms of compost you can make since it requires virtually no work. This allows you to do something productive with all of those leaves and your garden soil will thank you for it by providing a bountiful harvest. Besides, your time can be better spent harvesting the fruits of your labor. They can be as sweet as sugar or as hot as lava and are used for everything from salads to the sauce you spread over your buffalo wings. They are called peppers. Peppers are what are known as cultivar plants which mean that they can be grown in a variety of colors. Their earliest traces can be found in Mexico and South America and later in Spain then moving its way through Europe. Peppers are a versatile vegetable in the way it can be used in various recipes. Because you can get them very sweet to very hot, there is sure to be a pepper out there that you will love. If you like home vegetable gardening like I do, then you need to add some peppers to your home vegetable garden. You won’t be sorry. Here are some tips to get your soil in tip top shape to ensure that your pepper plants will produce an abundant harvest. The first thing you need to ask yourself is whether or not the pH level of your soil is in the appropriate range for pepper seeds to germinate as well as pepper plants to grow properly. Pepper plants love acidic soil. They do well when your soil is closer to 5.5 as opposed to neutral of 7.0. Invest in a $4 soil testing kit from your local home or garden center and test the soil to make sure it is acidic enough. If not, follow the instructions that come with the tester so you can make the necessary adjustments. Next is to understand the nitrogen, potassium and phosphorous requirements for peppers. Peppers make it easy on you since your soil levels should all be in the high range. You can best satisfy these requirements by making sure you add in plenty of good compost before, during and after the growing season. Your grass clippings make for good compost as does your food left overs. You can visit our website for tips and tricks on creating quality compost. The final step is to make sure the soil temperature is correct. Pepper seeds like the soil to be very hot in the 80 to 85 degree Fahrenheit range. You can warm up your soil by putting down some plastic before you plant the seeds. Test the soil temperature with a soil thermometer and when you hit the right level, remove the plastic and plant your seeds. If you are a fan of eating peppers then you should definitely become a fan of growing them. You can easily grow and harvest all of the peppers you will need right in your own backyard. I love potatoes and who can argue. You can take a potato and make an unlimited number of great food recipes that can be found anywhere over the Internet. I recently posted this question on my Vegetable Gardening Facebook page, “what do you make with potatoes?” I received hundreds of different recipes and ideas, many of which I never heard of leading me to believe that potatoes are one of these most versatile vegetables that you can grow. To grow your own potatoes, you will need a plastic container, toothpicks, water and of course a potato, well a half of a potato actually. Here is how you can start growing potatoes in your home vegetable garden. Take the potato of choice, I love sweet potatoes, that you wish to grow in your vegetable garden and cut it in half. You can either use both halves and have two of the same potatoes growing at the same time (speeds production up a bit) or just eat one of the halves and use the other to get your potatoes going. Now that you have one half of the potato cut and ready to go, plunge toothpicks in the potato so that they, the toothpicks, are sticking out of the sides. The toothpicks are used to suspend the potato about an inch above the bottom of the plastic container so that the bottom of the potato can take in plenty of water. You can see pictures of what this looks like on my website. Place your toothpick laden potato into the plastic container. If the bottom of the potato touches the bottom of the plastic container you will either need to move the toothpicks or get yourself a deeper plastic container. It is very important that the bottom of the potato has at least an inch of “breathing” room. Fill the plastic container (that has the potato suspended in it of course) with water. Always, always, always make sure that there is ample water in the plastic container at all times. Potatoes use a lot of water so don’t be surprised if you are filling your container on a daily basis. Place your potato and water filled plastic container on a window sill that receives ample sunlight throughout the day, preferably a window sill that gets sunlight first thing in the morning. The potato will start sprouting from the top and eventually start growing roots at the bottom. Once the potato has grown enough roots to nearly fill the plastic container, it is ready to move to the soil. You will bury the entire potato so that just the sprouts at the top are exposed. That is it. Potatoes spread like wildfire. Watch in amazement as what was once just a half of potato can literally grow into an unlimited amount depending upon the space that you have. We have all been there before. A nice tomato is getting ripe, red to the point where it looks almost too perfect. You think to yourself that you will give the tomato just one more day on the vine and low and behold when you go back, it has a huge crack in it. Cracking is a common condition in tomatoes, celery and rhubarb which is either caused by the changes in soil moisture of a deficiency in certain soil elements. Here are some ideas you can try to help prevent this issue from occurring. Start by taking a pH level reading of your soil. I can not mention this enough. The pH level of your soil is very important and you can get a test kit from your local home or garden center for just a few bucks. Get your soil in the 6.5 to 7.5 range for most fruits and vegetables. The few bucks that you spend on the kit will be well worth the money. Give your garden a good mulch, hopefully with some quality compost that you created. Mulching helps regulate the soil moisture. By using compost as your mulch not only are you regulating the moisture by you are adding much needed nutrients to the soil over a slow release. When your fruits and vegetables are ripe do not wait any longer go ahead and pick them. Sure letting them grow a day or two longer will help retain a lot of the flavor, but if your garden is susceptible to cracking don’t chance it. As a side note there a number of genetically engineered tomatoes specifically created to reduce cracking as well as many other diseases and susceptibility to garden pests. If cracking or idea problems persist in ytour home vegetable garden, you may want to give a few of these types of seeds a try. Cracking is very common and we have all been victims of it at one time or another in our vegetable gardening adventures. However, it does not have to ruin your entire growing season. Follow these ideas and you will greatly reduce the chances of cracking occurring in your home vegetable garden.